This article is about the section of Pennsylvania Route 611 in Philadelphia. For the entire route, see Pennsylvania Route 611. For the former train station, see Broad Street Station (Philadelphia). For the historic district, see Broad Street Historic District (Philadelphia). 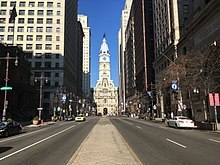 Broad Street is a major arterial street in Philadelphia, Pennsylvania. It runs for approximately 13 miles beginning at the intersection of Cheltenham Avenue on the border of Cheltenham Township and the West/East Oak Lane neighborhoods of North Philadelphia to the Philadelphia Navy Yard in South Philadelphia. It is Pennsylvania Route 611 along its entire length with the exception of its northernmost part between historic Old York Road and Pennsylvania Route 309 (Cheltenham Avenue) and the southernmost part south of Interstate 95. Broad Street at night along the "Avenue of the Arts" section, looking north towards City Hall, 2005. Broad Street is served by many public transit routes, including SEPTA's Broad Street Line subway and several SEPTA City Bus routes. Broad Street has gone through various changes since its beginnings in Colonial America. Thomas Holme introduced the first geographical plan of the city to William Penn in 1687. Composing of a center square, Holme designed the street to be roughly 100 feet across and 13 miles long. Penn intended that the center square would eventually be home to Philadelphia's City Hall. During the American Revolution, the street was often settled by troops moving in and out of the city. As the city's population grew, Broad was extended both north to Vine and south to Dickinson, eventually reaching the Delaware Waterfront, where today's Philadelphia Naval Shipyard stands. It remains Philadelphia's longest straightaway and one of the longest urban boulevards in the United States. During the early stages of the 19th century, Broad Street was home to many wealthy residents, especially around the Rittenhouse square area. Homes were designed in Victorian and Gothic styles. South Broad became center for the fine arts with the establishment of the Academy of Music in 1857. A Masonic Temple, The Pennsylvania Academy of the Fine Arts and the Adelphi Theater were also built during the same time period. Banks and offices grew in number around center city as well as high rise structures. The corner of Spring Garden housed Baldwin Locomotive Works founded by Matthias Baldwin in 1825. Baldwin's company was one of the biggest steam locomotive producers before the transition to diesel powered trains. Broad Street's biggest addition came with the construction of City Hall intersecting Broad and Market. With the progression of the Industrial Revolution Philadelphia became a center for trade and commerce. Transportation growth gained prominence with the construction of the Broad Street Station in 1881. Social life dominated the street during the second half of the 19th century. Elaborate hotels such as the Divine Lorraine and the Majestic were centers for night life. Standing over 10 stories tall the Lorraine was one of the tallest residential structures in Philadelphia. Private clubs such as the Columbia and Mercantile were popular during the Gilded Age. At the turn of the 20th century, Broad Street transformed from a bustling boulevard to a cultural magnet for music and the arts. January 1, 1901 introduced the very first Mummers Day parade which has become a staple of Philadelphia culture. Jazz and gospel gained popularity at the grassroots level due primarily to the Great Migration of the early 1900s. One such place for Jazz and Blues music was the Uptown Theater, built in 1927. By the 1950s Broad Street residential areas had been replaced with skyscrapers as well as the newly developed Penn Center. Since the 70s the street has undergone various city renovations. With $100 million in public funds Broad has received new lighting and streetscaping, restored theaters as well as new restaurants and cafes. Lamp post fixtures have been improved as well as sidewalk pavements and subway entrances. In 2015 Philadelphia Mayor, Michael Nutter, introduced a $8.7 million project to brighten North Broad with forty one stainless steel light masts. Image of City Hall from North Broad Street showing the new lighting masts. The lighting masts begin a block south of Spring Garden Street and move north. Broad Street is home to several Philadelphia cultural landmarks. During the administration of Mayor Ed Rendell, Broad Street between Spruce and Market Streets, became known as the Avenue of the Arts, where it is home to art galleries, the Academy of Music, and the Kimmel Center. North of City Hall is the Pennsylvania Academy of the Fine Arts. The South Philadelphia Sports Complex, near Broad's south end along Southern Boulevard Parkway, is the site of Citizens Bank Park, Lincoln Financial Field, and the Wells Fargo Center. Demolished sports facilities located in this area were John F. Kennedy Stadium, the Spectrum, and Veterans Stadium. As a result, the Philadelphia Flyers are nicknamed the "Broad Street Bullies". South of the sports complex and interchanges with the Schuylkill Expressway (Interstate 76) and Interstate 95, Broad Street has its southern terminus in the former Philadelphia Naval Shipyard. The former offices for The Philadelphia Inquirer and Philadelphia Daily News newspapers are on Broad Street just north of City Hall and the former PA State Building is at the intersection with Spring Garden Street. Most recently, the Public School District Administration relocated between these two landmarks. Also located on North Broad at its intersection with Fairmount Avenue is the historic Divine Lorraine Hotel. Farther north, Broad passes through the campus of Temple University. Included on Temple's campus is the performing arts center, established in 1891. Once a Baptist temple, it has now become a prime part of the "Avenue of the Arts." Where Broad Street intersects with Clearfield Street in North Philadelphia is the exact location of the 40th Parallel. At the corner of Broad and W. Glenwood Ave is the former personal gym of heavyweight champion boxer, Joe Frazier. Having lived atop the gym for several years, it has now been turned into a furniture store. Broad Street often serves as the main parade route for Philadelphia sports championship parades, most recently for the Eagles Super Bowl LII victory. During the Phillies 2008 World Series victory parade, an estimated 2 million people lined Broad Street. The largest gathering for a championship parade was for the Flyers in 1974. One of the busiest streets in the country, Broad Street is shut down for the annual 10-mile (16 km) Broad Street Run. Passing by some of Philadelphia's most famous landmarks, the course averages over 35,000 participants a year. Additionally, the section of Broad Street from near Oregon Avenue (Marconi Plaza) to City Hall, in South Philadelphia and Center City, is the traditional location of the Mummers Parade on New Years Day. Public transportation along Broad Street includes SEPTA's Broad Street Line subway, which served an average of about 137,000 riders per weekday in 2010, running beneath Broad Street for most of its length. The subway starts at the Fern Rock Transportation Center in the Fern Rock neighborhood in North Philadelphia and begins to follow Broad Street at the Olney Transportation Center, extending south through Center City to NRG station at Pattison Avenue in South Philadelphia. Several SEPTA City Bus routes run along Broad Street, with Routes 4 and 16 following Broad Street for most of their routes. The Route 4 bus follows Broad Street from Pattison Avenue in South Philadelphia north to Rising Sun Avenue in North Philadelphia, where it diverges to the east to head to the Fern Rock Transportation Center. The Route 16 bus follows Broad Street from Philadelphia City Hall north to its terminus at Cheltenham Avenue, where the bus route continues west along Cheltenham Avenue to the Cheltenham-Ogontz Bus Loop. "Avenue of the Arts" (from Glenwood Avenue to Washington Avenue). This section of Broad Street includes many prominent theater and concert halls, including the Academy of Music, Kimmel Center for the Performing Arts, Merriam Theater, Wilma Theater, University of the Arts Gershman Hall, and Suzanne Roberts Theater. The street has "AA" lights all along the way, which is the abbreviation for Avenue of the Arts. Avenue of the States: from Washington Avenue to Oregon Avenue. Along this section of Broad Street fly the flags of all 50 states in the US. Southern Boulevard Parkway: from Oregon Avenue south to Pattison Avenue to the Gatehouse of the Philadelphia Navy Yard connecting Marconi Plaza and FDR Park, an Olmsted Brothers landscape design 1904-1916 and fully utilized as the center roadway for the 1926 Sesquicentennial Exposition world's fair celebrating the birthday of the United States. C. A. Tindley Boulevard: from South Street to Washington Avenue. This was dedicated to the late Charles A. Tindley, the father of gospel music. Tindley Temple United Methodist Church was his home, at the corner of Broad and Fitzwater Streets. Georgie Woods Boulevard: from Diamond Street to York Street. Used to be part of PA 291, from Moyamensing Avenue to City Hall. The entire route is in Philadelphia, Philadelphia County. 7.4 South Penn Square/John F. Kennedy Boulevard No direct connection to PA 3 (Market Street) due to interruption by Philadelphia City Hall, which connects via 15th Street. ^ a b Google (July 14, 2018). "Broad Street" (Map). Google Maps. Google. Retrieved July 14, 2018. ^ "South Broad Street — Philadelphia, Pennsylvania". Great Places in America: Streets. Retrieved 10 October 2014. ^ a b c d e Kyriakodis, Harry (2013). "Broad Street". Encyclopedia of Greater Philadelphia. Retrieved 2015-12-08. ^ "Broad Street Station". PhillyHistory Blog. Retrieved 2015-12-08. ^ a b "The Lost World of North Broad Street". PhillyHistory Blog. Retrieved 2015-12-08. ^ a b c "South Broad Street — Philadelphia, Pennsylvania". www.planning.org. Retrieved 2015-12-08. ^ "Log in to NewsBank". infoweb.newsbank.com. Retrieved 2015-12-08. ^ Gottlieb, Dylan (2015). "Avenue of the Arts". Encyclopedia of Greater Philadelphia. Mid-Atlantic Regional Center for the Humanities, Rutgers University, Camden. Retrieved Dec 9, 2015. ^ a b "Log in to NewsBank". infoweb.newsbank.com. Retrieved 2015-12-08. ^ a b Nunnally, Derrick (November 1, 2008). "A party for, oh, 2 million of their closest friends". Philadelphia Inquirer. p. F2. Some in the news media guessed two million, about the same number long tied to Flyers parades in 1974 and 1975, and more than the current population of Philly. ^ Lin, Jennifer; Steele, Allison; Dwight Ott (October 31, 2008). "Parade for the Champs; Noon High: Million-plus expected at celebration". Philadelphia Inquirer. p. A1. In the annals of Philadelphia sports parades, the biggest crowd turned out for the 1974 celebration of the Flyers' Stanley Cup. More than two million fans flocked to Broad Street. ^ "Thousands attend Phillies World Series parade". Yahoo! Sports. October 31, 2008. Retrieved November 22, 2010. ^ "Blue Cross Broad Street Run 10-Miler". Philadelphia - Official Visitor Site - visitphilly.com. Retrieved 2015-12-08. ^ SEPTA Official Philadelphia Transit & Street Map (PDF) (Map). SEPTA. Retrieved November 25, 2018.